Your Bathroom is the one place in your home where everybody, even your guests will go to at some hour of the day or night. It serves to freshen up, clean and beautify our bodies causing steam, smells and humidity to linger long after we’ve left. In fact the bathroom is one of the hardest working rooms in your house and it is therefore worth giving some time to planning your bathroom suite design. Not long ago the bathroom was judged solely to be a functional room and its layout and design were not given much thought by the average builder. The result was peeling wallpaper, splash design tiles in mint green or yellow, wood latte bath panels, make shift presses built around the basin pedestal for some storage, lino on the floor and black spots growing on the ceiling. Creativity and Design were certainly not words associated with the average bathroom. Bathroom suite planning and design is now one of the biggest decisions in re modelling your home, and will have a direct effect on the sale of your home if you should decide to sell. It is a good idea to note the needs and wants of everyone in your home before looking at a bathroom suite design in order to incorporate both luxury and practicality. Think about your personal requirements and other users requirements; i.e. bath or shower, space, storage, heating, lighting, child proofing, accessibility etc. everyone has different needs and you need to consider who will be using the bathroom. Have your budget in mind; It is important to know how much you have to spend on your new bathroom so that you can choose from materials within your price range. Decide on the size and shape of your bathroom. This may include knocking down walls and or inserting walls to get the desired shape required. These walls are mainly partition and not too difficult to move. Decide on the size, shape and location of windows required. Ensure that the windows are large enough to let in sufficient light but not too large as to take up a whole wall. Once you have decided on the physical size of your bathroom you can now decide on what appliances and accessories would match your design. 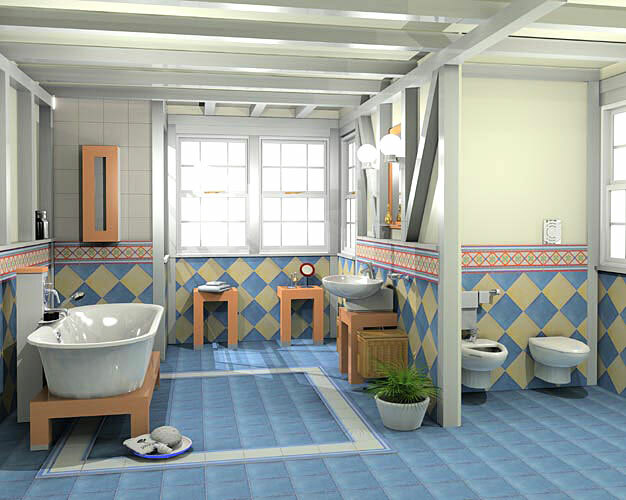 This is not an easy task and it is derived from what uses the bathroom has and who is primarily going to use it. If a bath is required should it be free standing or along a wall, do we also want to include a shower unit as part of the bath or a standalone unit. What type of toilet, wash hand basins are required and where should they be located. Also should we include a heated towel rail and where is the best location for it? Have you considered electric under-floor heating? Inexpensive to run and glorious underfoot! The type of shower you choose will start with deciding on one of three basic options. There is an alternative to the above power shower. That is a shower that comes in a box similar to the instant electric shower. It has a built in pump and delivers a good pressure. The hot water will be provided by your central heating or immersion as above, however the cost of buying this shower will be almost half of the mixer valve and pump option above. The next thing that you have to decide is tiling. Again there are many different types of tile eg ceramic, porcelain, stone etc Should you tile all of the walls or half way up a wall. What colour and shape etc. 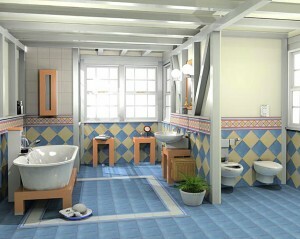 Again this is not an easy task and time needs to be taken in order to match the overall design of the bathroom. Light is very important in any bathroom. Light can have a huge impact on the ambience of a bathroom. Again there are various options such as up lighting , down lights or a combination of both. When you have gone through steps 1 – 6 you now have to find out how the job is going to be carried out and who will do it. Look for an installer, who will do the whole job for you as it saves you sourcing a plumber, electrician, carpenter, tiler etc. and trying to co-ordinate them to be there to do the job at the same time so as not to have your house disturbed for a long period of time or to avoid running the risk of having an unfinished job and no come back. If you are removing an old WC, basin, shower and/or bath and all your old tiling, and you will have to discard all the packaging of your new materials, you will need to hire a skip. Keep the cost of this in your budget and plan where to put it before it arrives. If you are on a busy street you may need a permit from the city or county council. Very often your designer or plumber will go off on an explanation as to why something needs to be a certain way or in a particular place, ant they will use a language or words that you don’t understand. This can be frustrating for both the plumber and yourself. Have a read through them so you will be able to understand and participate in these important conversations.